Sparkasse (the name for savings banks in German speaking countries) was founded over two centuries ago by wealthy German merchants, intellectuals and academics, in order to encourage savings among the public, and reduce the needs of the poorest, guaranteeing minimal social welfare. There are currently around 450 savings banks operating in a network of over 16,000 branches and with 261,000 employees. 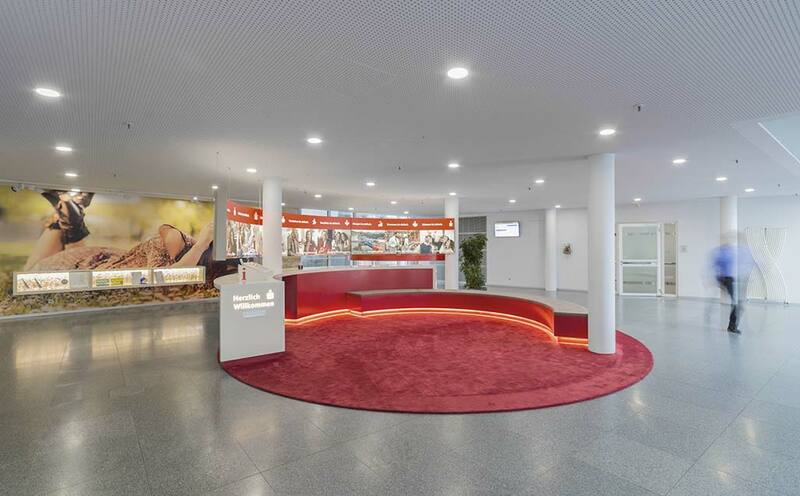 In the case we are looking at, the lobby ofSparkasse Central (Regensburg, Germany) was originally planned as a reception with customer service personnel, but was ultimately converted into an information area for clients who could register on a display upon arrival, and find out about new Sparkasse products. This is how the idea arose to create an Information ARENA which would use the circular shape of the premises. The solid surface from PORCELANOSA Group, KRION, was chosen by architects K R A N Z Das moderne Büro GmbH and designers Hornburg und Thumann GbR, thanks to its resistance, durability and quality, characteristics which represent the essential values of Sparkasse. We can find KRION in colours 6501 Cream and 6401 Red Fire, perfectly combined with the corporate colours of Sparkasse. The commercial units of this project have been perfectly combined with both colours to create the curved information point which incorporates screen supports and backlighting created with KRION6501 Cream. The 6401 Red Fire colour provides the corporate colour, used as a base for the bench, support and drawer unit. In the rear section next to the wall, we find a shelf, incorporating windows, created with 6501 Cream, used to present awards and certifications granted to Sparkasse.